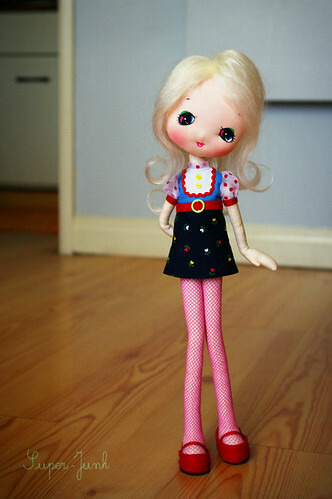 Pose Doll Reservation Thread – closed! Thanks for playing this round of Fastest Finger! Well, I learned a lot tonight. Thanks for bearing with me while I experiment with my selling method. Next time I may try a comment lottery so more time zones can participate. (and I will make sure that there are no crossposts to confuse commenters!). Guess I just have to make more poseys! 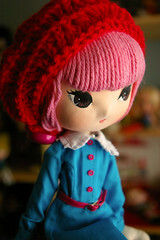 I’m so glad that people like my little dolls and snap them up quickly. 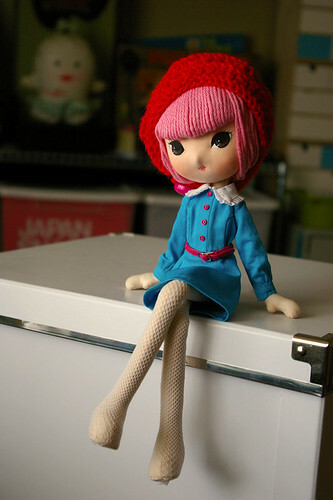 However, I am worried about disappointing customers/friends when dolls sell out in less than a minute. I like setting a price that I think it is fair, but I think eBay might be a more practical format to sell in, since it gives people a chance to at least bid if they want an item badly enough. To be completely honest, the goal of these sales is not to make a profit – I make way less per hour on crafts than I would making websites. Crafting though, is very theraputic for me and trust me, I need it right now (work is stressful and if I’m not careful I will get depressed and get nothing done). Ff I don’t sell what I make, my house will fill up with knick-knacks, and I hate to dust. I’ve received a couple of requests to sell “preorders,” but the truth is that this is not a format I am comfortable with. The quantity I can produce is directly related to how creative and inspired I’m feeling, and that motivation disappears as soon as I have orders to fill. It starts to feel like work, which defeats the purpose! 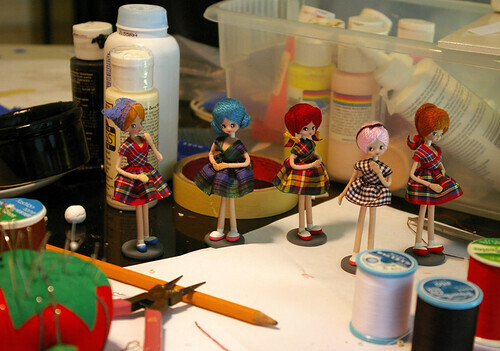 I consider myself more of a seamstress than a crafter, but today after finishing a batch of these little micro pose dolls, I realized that I like making them so much because they do not involve the sewing machine at all! 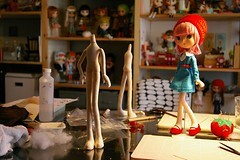 It felt good to break out the craft supplies and just watch these little dolls evolve from blobs of clay and wire. I felt like I was back in my mom’s kitchen with the tacky glue, ribbons, paint brushes, craft paints and sculpey scattered all over the table (heck, it’s the same table!). As soon as the last dot of makeup goes on, they get their teeny little personalities. The redhead emerged as the leader of the group – she’s got a lot of sass in that 3-inch frame. The little pink and blue ones are both pretty mild mannered. The brunette (I call her “Midge”) is a bit of a narcissist, probably because it took me so many tries to get every hair in her pony-tail just so. I worked out a bunch of kinks from my prototype – the ones I made to sell have softer hair, sturdier hips and ankles, and paler faces. I still want to improve the hands and feet – sculpting in miniature is not my strong suit. 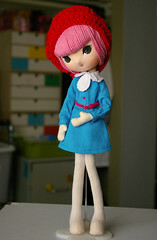 Next weekend, I promised Paul (and myself) that I would try the other end of the spectrum and make a BIG doll. I’m excited and scared to try both soft-sculpture and actually painting a face that is more than a couple of dots. 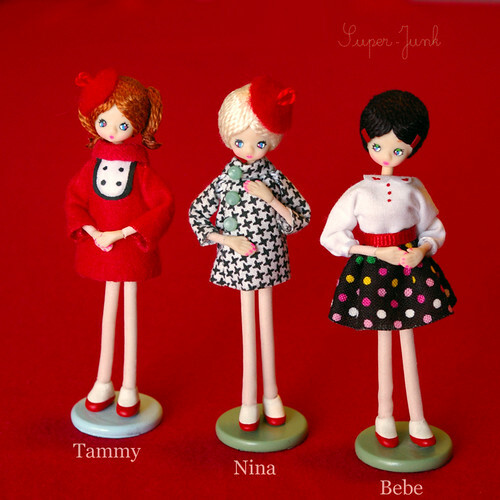 I’ll announce soon when I am putting these girls in my shop – I want to perfect some clear tubes for them to ship and display in. 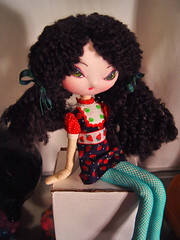 Pose dolls need tubes to be complete. Just wanted to say a quick thank you for making my first sale incredibly fast! I was shocked that by the time I looked at my own shop after posting, it was empty! On March 1, I moved into “my first place.” Looking back, it’s amazing how long I lived with my family, and how much different it is living alone. It took me about a month to get used to all the quiet, but after my school’s “spring break” ended, both my jobs are keeping me busy as ever. I’m teaching two more classes than I used to, and building websites in-between. In the mix of moving and working, I tried to fill every spare moment with thrifting, organizing, and working with Paul on a girl for the CWC Anniversary exhibit (Wish we could make it to Japan this year to see her and all of the amazing contestants!). Not only does this spring bring a big change to where I’m living, but I resolve to make big changes in how I live. Living alone has shown me just how many resources I waste – I’m making a big effort to re-use and re-purpose what I have, resisting the temptation to shop the big-box-marts to fill my empty cupboards. I’m also trying to eat healthier – I’m currently addicted to raw green smoothies (made a big batch of mango parsley this morning – YUM! ), and walking or riding my bike places I used to have to drive to. I’m already noticing a change in the way I feel waking up in the mornings. Now that the dust has settled, I’m looking forward to having a bit of time to take pictures and write again. Shoot me a comment if you need my new address for your books.